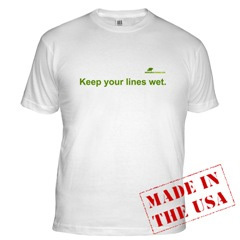 We have opened a Café Press t-shirt shop for those that would like to buy a ?Keep your lines wet.? T-shirt! Now you can get Daniel Nielsen's character phrase "Keep your lines wet." t-shirt at Cafepress. There are actually many different types of shirts to buy. You can buy the shirts by going to the link below. 13fYou really make it seem so easy with your pritsneateon but I find this matter to be actually something which I think I would never understand. It seems too complicated and extremely broad for me. I'm looking forward for your next post, Ie28099ll try to get the hang of it!